Everything The O.C. : The O.C in the News: Ben dining with his daughter Frances! The O.C in the News: Ben dining with his daughter Frances! 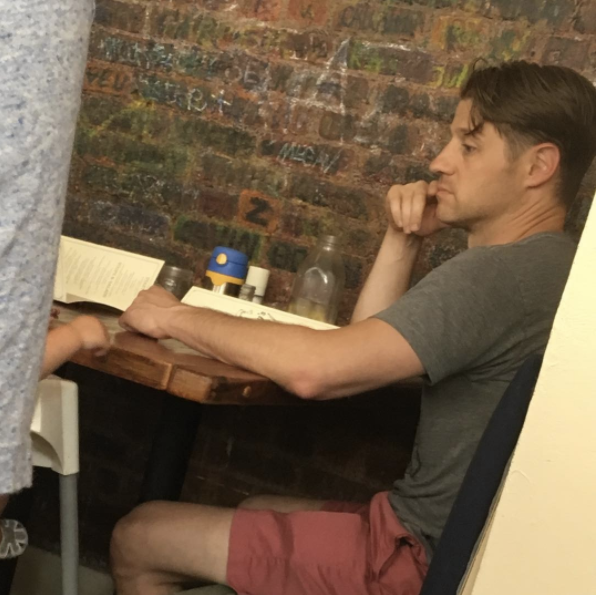 Here we have a rare photo of Benjamin Mckenzie taken recently. Ben is dining at a restaurant with his baby daughter Frances (she can barely be seen). Let's face it, life has changed full swing for good ole Chino, he's now married with a child. Although Ben's expression here looks a bit like he's contemplating when life was a bit more simple, you know when he had the good life, living in a pool house, punching people and working at the Crab Shack. ahhhh, those were the days! But you do you Ben, we're rooting for you either way! The O.C. Holidays: Happy Eclipse Day 2017! The O.C. Memes: When someone tells you..